Work supported by a grant from World Health Organization Special Programme for Research and Training in Tropical Diseases (n 910273). A field study of the immune response to the shed acute phase antigen (SAPA) of Trypanosoma cruzi was carried out in the locality of Mizque, Cochabamba department, Bolivia. Schoolchildren (266), with an average of 8.6+/-3.6 years, were surveyed for parasitological and serological diagnosis, as well as antibodies directed against SAPA using the corresponding recombinant protein in ELISA. The antibodies against SAPA were shown in 82% of patients presenting positive serological diagnosis (IgG specific antibodies). The positive and negative predictive values were 0.88. Antibodies anti-SAPA were shown in 80.8% of the chagasic patients in the initial stage of the infection (positive IgM serology and/or positive buffy coat (BC) test) and in 81.4% of the patients in the indeterminate stage of the infection (positive IgG serology with negative BC and IgM tests). These results show that the anti-SAPA response is not only present during the initial stage of the infection (few months) but extends some years after infection. Trypanosoma cruzi, the causative agent of Chagas' disease, is characterized by the occurrence of distinct acute and chronic phases. Generally, the acute phase is totally asymptomatic and subsides spontaneously within two or three months. Then the infection becomes latent with sub-patent parasitemia. Both phases are associated with a specific humoral response allowing the serodiagnosis of Chagas' disease. During recent years, several T. cruzi antigen genes have been cloned and used in serodiagnosis (Moncayo & Luquetti 1990, Levin et al. 1991, Cetron et al. 1992). The main objectives were solving problems related to the existence of false positive diagnosis, detecting early infections and establishing potential diagnosis in distinguishing different stages of disease. Among them, T. cruzi shed acute phase antigen (SAPA) has been proposed for early diagnosis of Chagas' disease (Affranchino et al. 1989, Frasch & Reyes 1990, Levin et al. 1991). According to Affranchino et al. 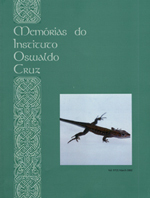 (1989) and Reyes et al. (1990) antibodies against SAPA are mainly present in acute and congenital sera. The T. cruzi SAPA has major trans-sialidase and neuraminidase enzymatic activities located in the N-terminus of the protein (Parodi et al. 1992, Campetella et al. 1992). Both enzymatic activities are related to the transfer of sialic acid in T. cruzi, and probably needed for T. cruzi internalization in the host cell (Prioli et al. 1990, Schenkman et al. 1991a,b). SAPA, anchored on the parasite surface, is mainly expressed in the infective (trypomastigote) stage of the parasite (Affranchino et al. 1989). Furthermore, SAPA molecule presents an antigenic domain, located in the C-terminal part which is composed of amino acid repeats (Parodi et al. 1992). Indeed, the SAPA molecule supports an enzymatic activity, probably relevant for parasite survival and an antigenic one, which does not affect the enzymatic activity, targeting immune response of the host. In this study, we examine for the first time anti-SAPA response among children living in a high endemic rural region for Chagas' disease in Bolivia. Patients and sera - Sera were from children (never treated for Chagas' disease) living in Mizque village located in a high endemic region of Bolivia (Cochabamba department). The children average age was 8.6+/-3.6 ranging from 2 to 15 years old. None of these children presented clinical symptoms from acute phase illness and parasitemia was individually established by examination of four buffy coat (BC test) direct method (La Fuente et al. 1984). Serological diagnosis - It was determined by four assays detecting specific IgG antibodies: hemagglutination (HEMAVE test, Polychaco, Buenos Aires, Argentine), immunofluorescence, and enzyme-linked immunosorbent assay (ELISA) performed in two different laboratories, using antigens obtained from epimastigote lysed forms. The diagnosis was based on positivity or negativity of three out of four tests. Moreover, specific IgM antibodies were detected by ELISA technique. Polymerase chain reaction (PCR) diagnosis - It was applied to 5 ml blood samples. The procedure was according to a previously described method (Wincker et al. 1994). Briefly, the blood was mixed V/V in 6M guanidine hydrochloride/200 mM EDTA buffer and boiled for 15 min. DNA was extracted from 100 ul of the mixture and the amplification performed as previously described with oligonucleotide primers chosen to amplify the hypervariable region of kDNA minicircles (HVRm). PCR products were analyzed by electrophoresis on a 2% agarose gel and visualized by ethidium bromide staining. Antibodies against SAPA - They were detected by ELISA technique, using fusion glutathione S-transferase/SAPA. This protein was produced in pGEX expression vector after subcloning the Eco RI fragment encoding the SAPA (clon #7) into the Eco RI restriction site, and purified in one step on a glutathione agarose column (Ibanez et al. 1987, Smith & Johnson 1988, Affranchino et al. 1989). Glutathione S-transferase (GST) was used as control for each sample at the same concentration than SAPA. The ELISA plastic 96-well plates (CML, Nemours, France), were coated with 100 ul of SAPA (100 ng/ml) diluted in 0.1M carbonate-bicarbonate buffer (pH 9.6). Plates were incubated 1 hr at 37 C, washed 3 times with PBS/Tween 5% buffer (PT buffer). Then the sensitized wells were incubated in 5% milk PT buffer 1 hr at 37 C and washed 3 times as above mentioned. Positive control, negative control and unknown serum samples were dilute 1/100 in PT buffer containing 3% of milk and 100 ul was add to each well. After 2 hr of incubation at 37 C, wells were washed 3 times with PT buffer. Then, 100 ml of peroxidase conjugate (0.5 mg/ml, anti IgG (H+L) human labeled with peroxidase, Bio Sys) PT buffer containing 3% of milk were added and the plate incubated 1 hr at 37 C. After washing as described before, the enzyme reaction was carried out using 100 ml per well of orthophenylenediamine as substrate solution (orthophenylenediamine 500 mg/ml in citrate buffer pH 5.5 and 10 ml of H2O2). After 20 min in darkness at room temperature, the enzymatic reaction was stopped by adding 50 ml/well of HCl 1N solution. The values were determined with ELISA's reader (Titertek Multiscan) at 492 nm. Each test was carried out in triplicate. Positive absorbance SAPA limit determination - To assess positive limit SAPA ELISA test, we selected from the studied sample, 103 patients as control population, presenting negative BC, 4 negative IgG serology tests and negative PCR diagnosis, as well as absence of IgM specific antibodies. For each sample, the SAPA absorbance was determined by the difference between GST-SAPA fusion protein and GST absorbances. Both values were the absorbance average calculated from a triplicate. In all cases, absorbances of GST-SAPA were higher than GST respective ones. The positive SAPA test absorbance limit, lod was calculate according to: lod = m + 2 delta with m = absorbance average of SAPA and d = standard deviation. The lod value was 0.38 with m = 0.15 and delta = 0.11. Diagnostic value of SAPA test - The study included 266 patients documented by BC test, IgG serological and PCR diagnosis, specific IgM and SAPA antibodies (Table I). 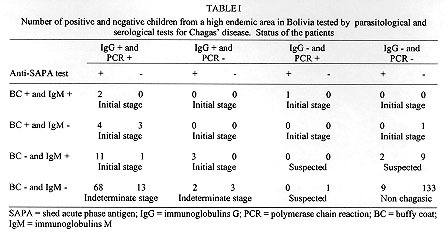 The children lived in a very high endemic region for Chagas' disease as evidenced by a prevalence of 41.3% of positive IgG serology (110/266). First, we examined the anti-SAPA response according to the serology established by the detection of IgG specific antibodies. Table II summarizes the diagnosis performance of the SAPA test. Antibodies anti-SAPA were shown in 38.3% of the studied individuals. The sensitivity and specificity were high (0.88 and 0.92 respectively). The predictive values were satisfactory to propose this test as complementary serological method of diagnosis in children. Among the 156 individuals presenting a negative IgG serology, 14 were positive for at least one of the following techniques: BC, PCR and IgM serology; only three patients showed associated antibodies anti-SAPA . The second point analyzed is the early diagnostic value of SAPA recombinant protein. We arbitrarily classified the individuals in conformity to the tests performed in the study (Table I). The patients presenting a positive BC or IgG antibodies were considered as chagasic. The clinical status of the chagasic patients was based on the direct detection of the parasites (BC) or the IgM serology. Table III sumarized the clasification of the 266 patients. We did not observe significant differences in the SAPA test between the initial and indeterminate stages (X^2 = 0.005, p>0.05). Moreover, we observed only 6.3% of positive anti-SAPA test in the non chagasic group. This population presented a negative parasitological diagnosis including PCR highly sensitive technique and negative serological diagnosis, associated with absence of specific IgM antibodies which are first synthesized in recent infection. One year later, we analyzed 11 patients pertaining to non chagasic (7) or suspected (4) groups, who had at the first control positive or negative SAPA test. 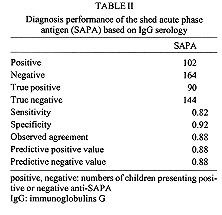 All patients with positive SAPA test (4) developed positive IgG serology. Among the 7 patients with negative SAPA test, 4 showed positive IgG antibodies for Chagas' disease. These rates of seroconversion were not significantly different in the two groups of positive and negative SAPA test (X^2 = 0.35, p>0.05). Consequently, the patients presenting positive SAPA test and negative IgG serology should be considered as false positives. The aim of this study was to assess the suitability of cloned recombinant SAPA for diagnosis of a children population living in a high endemic area in Bolivia. Moreover, we tested the discrepancies' value of the test between initial and later stages of Chagas' infection. The study was supported by two parasitological diagnoses (BC and PCR) and some serological tests: four to detect IgG antibodies and one for IgM. The diagnosis value index, evaluated on the entire population and based on conventional diagnosis (tests that detect the specific IgG response) was high: the sensitivity is 0.88 and specificity 0.92. Moreover, the results were unexpected according to previous reports considering the anti-SAPA immune response as specific of the acute stage of the infection (Affranchino et al. 1989, Frasch & Reyes 1990, Reyes et al. 1990, Levin et al. 1991, Vergara et al. 1991). Nevertheless, such a population composed only of children of an endemic region had never been studied. Moreover, we standardized for the first time the ELISA technique to the detection of antibodies against SAPA using the purified recombinant protein, instead of phage dot array immunoassays. The population under study included children in different stages of the infection. Acute stage of the infection is commonly defined by the presence of circulating trypomastigotes detected by microscopical examination. This criterion is fully risky as we did not observe in this children population any case presenting high level of circulating parasites. The microscopic detection is difficult and depends on the observer. The primary immune response in the acute phase are IgM antibodies. Nevertheless, when patients present only IgM antibodies with absence of circulating parasites assessed by direct examination and by PCR, and show absence of IgG response, it is difficult to corroborate the infection. In the initial stage group, we included children with positive BC and/or positive specific IgM antibodies associated with IgG antibodies. The results of SAPA test did not demonstrate significant difference between the group of initial infection and the other chagasic patients. Therefore, 80.8% of patients in the initial phase of infection showed positive SAPA test. Moreover, if we considered the patients with positive BC (11 patients), we observed 63.6% of them with positive SAPA test. It is worth noting that previous reports referred to small groups of acute cases, and the reactivity percentages ranged from 60% to 93% according to the patients' samples (Affranchino et al. 1989, Levin et al. 1991). Within the indeterminate group, the high prevalence of positive anti-SAPA test was unexpected (81.4%). Others reported in chronic patients contrasting percentages ranging from 10% to 66%, but the clinical status (pathology) of these patients is not always documented and these groups are mainly composed by adult patients (Affranchino et al. 1989, Levin et al. 1991, Vergara et al. 1991). Our chosen group is probably constitued in its majority by asymptomatic patients, because the pathology mainly appears many years or decades later after the initial phase. Thus, these patients were classified as pertaining to the indeterminate form. The SAPA molecule is composed by two domains, one enzymatic and another antigenic and is mainly expressed in trypomastigote forms. T. cruzi is an intracellular parasite which multiplies inside mammalian host cells. After several intracellular divisions, the amastigote forms of the parasite differentiate into trypomastigotes which invade other cells. The neuraminidase and trans-sialidase activities mainly beared by SAPA molecule are implicated in the invasion of the parasite. Here, we evidenced high level of SAPA antibodies in a rural chagasic population of children. During the first years of the infection, there are probably many trypomastigote forms associated to an intense cell invasion. This may induce high antibody production. Thus, the intracellular parasite multiplication phase is probably not limited to the acute phase (2-3 month), but extends during several years after the initial infection. The anti-SAPA response could be a marker of active infection. Afterward, in the chronic infection stage, circulating parasites are absent or scarce. The parasite intracellular multiplication should be reduced and, as a consequence, anti-SAPA response diminished. To verify the above hypothesis, a follow-up of the anti-SAPA response in an adult population from the same endemic region is in course. Affranchino JL, Ibanez CF, Luquetti AO, Rassi A, Reyes MB, Macina RA, Aslund L, Petterson U, Frasch ACC 1989. Identification of a Trypanosoma cruzi antigen that is shed during the acute phase of Chagas' disease. Mol Biochem Parasitol 34: 221-228. Campetella O, Sanchez D, Cazzulo JJ, Frasch ACC 1992. A superfamily of Trypanosoma cruzi surface antigen. Parasitol Today 8: 378-381. Cetron MS, Hoff R, Kahn S, Eisen H, Van Voorhis WC 1992. Evaluation of recombinant trypomastigote surface antigens of Trypanosoma cruzi in screening sera from a population in rural north-eastern Brazil endemic for Chagas' disease. Acta Trop 50: 259-266. Frasch ACC, Reyes MB 1990. Diagnosis of Chagas' disease using recombinant DNA technology. Parasitol Today 5: 137-139. Ibanez CF, Affranchino JL, Frasch ACC 1987. Antigenic determinants of Trypanosoma cruzi defined by cloning of parasite DNA. Mol Biochem Parasitol 25: 175-184. La Fuente C, Saucedo E, Urgel R 1984. The use of microhaematocrit tubes for the rapid diagnosis of Chagas' disease and malaria. Trans R Soc Trop Med Hyg 78: 278-279. Levin MJ, Franco da Silveira J, Frasch ACC, Camargo ME, Lafon S, Degrave WM, Rangel-Aldao R 1991. Recombinant Trypanosoma cruzi antigens and Chagas' disease diagnosis: analysis of a workshop. Fems Microbiol Immunol 89: 11-20. Moncayo A, Luquetti AO 1990. Multicenter double blind study for evaluation of Trypanosoma cruzi defined antigens as diagnosis reagents. Mem Inst Oswaldo Cruz 85: 489-795. Parodi AJ, Pollevick GD, Mautner M, Buschiazzo A, Sanchez DO, Frasch ACC 1992. Identification of the gene(s) coding for the trans-sialidase of Trypanosoma cruzi. Embo J 11: 1705-1710. Prioli RP, Mejia JS, Pereira MEA 1990. Monoclonal antibodies against Trypanosoma cruzi neuraminidase reveal enzyme polymorphism, recognize a subset of trypomastigotes, and enhance infection in vitro. J Immunol 144: 4384-4391. Reyes MB, Lorca M, Munoz P, Frasch ACC 1990. Fetal IgG specificities against Trypanosoma cruzi antigens in infected newborns. Proc Natl Acad Sci USA 87: 2846-2850. Schenkman S, Dias C, Nussenzweig V 1991a. Attachment of Trypanosoma cruzi trypomastigotes to receptors at restricted cell suface domains. Exp Parasitol 2: 76-86. Schenkman S, Jiang MS, Hart GW, Nussenzweig V 1991b. A novel cell surface trans-sialidase of Trypanosoma cruzi generates a stage specific epitope required for invasion of mammalian cells. Cell 65: 1117-1126. Smith DB, Johnson KS 1988. Single-step purification of polypeptides expressed in Escherichia coli as fusion with glutathione S transferase. Genetica 67: 31-40. Vergara U, Lorca M, Veloso C, Gonzalez A, Engstrom A, Aslund L, Petterson U, Frasch ACC 1991. Assay for detection of Trypanosoma cruzi antibodies in human sera based on reaction with synthetic peptides. J Clin Microbiol 29: 2034-2037. Wincker P, Bosseno MF, Britto C, Yaksic N, Cardoso MA, Morel CM, Breniere SF 1994. High correlation between Chagas' disease serology and PCR-based detection of Trypanosoma cruzi kinetoplast DNA in bolivian children living in an endemic area. Fems Microbiol Letters 124: 419-424.